Slidell native Aubrey Morgan (BA 06) was still a teenager when she moved to New York to study dance, winning awards and becoming a member of the esteemed New York City Ballet along the way. Then, at age 21, she took a step back. "I started to think, ‘What if I can’t do this forever? If I spend all of my time and all of my brainpower and all of my abilities in a studio...what if something happens to me and I have no other skills?’” The pursuit of a well-rounded education led her to the University of New Orleans, where she completed a degree in English with a minor in pre-med. Still, she couldn't stop her feet from dancing, and they carried her all the way back to New York for the chance of a lifetime: a role in Phantom of the Opera on Broadway. A degree from the University of New Orleans is a big step toward landing that dream job. Our free workshop helps students put their best foot forward. On January 23, alumni professionals in a variety of fields will give of their time to help students and recent graduates polish their resumés with one-on-one guidance. If you are a recent graduate interested in honing your resumé, please RSVP with your name, email, major, and field(s) of interest by January 18th to the Office of Alumni Affairs at (504) 280-2586 or alumni@uno.edu. If you are an established alumni professional or have hiring experience and are interested in volunteering at this or future events, please call or email our office. The College of Education and Human Development at UNO prepares more educational personnel than any other college in the greater New Orleans area. It's no surprise, then, that nine of the 53 "Top Gains" schools recognized as the most improved in Orleans and St. Tammany parishes are helmed by COEHD alumni principals and master teachers. State Superintendent of Education John White awarded nearly half a million dollars to the schools in acknowledgement of their commitment to improving education in Louisiana. It's more than just a ribald puppet show and it's definitely not for kids. 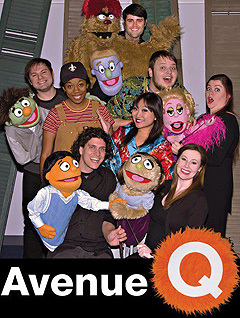 Avenue Q brings to the stage of the Jefferson Performing Arts Society, "serious issues such as sexual identity, self-doubt, and finding meaning in life," says graduate student Robert Facio (MFA 13), who mans the role of Trekkie Monster in the production. Alumnus Scott Sauber (BA 97) stars as Princeton, a recent college graduate facing the immensity of his future. "Because Avenue Q is a puppet show, some may expect that it is simple or 'fluff,'" Facio explains. "Thanks to our time spent at UNO - both socially and academically - and the lessons we learned from our experiences there, we have been able to gain a better understanding of the characters and the more serious, underlying issues that they deal with. This knowledge has enabled us to help draw out these themes and make this production of Avenue Q not only hilarious and bawdy but also heartfelt and meaningful." The play also leaves the puppeteer actors visible behind their plush characters, a delicate balance calibrated by alumna choreographer Lindsey Romig (M.Ed 12). Click here for tickets and showtimes. The new year brings James E. Payne to the University of New Orleans as provost and vice president for academic affairs. Payne, who holds a Ph.D. in economics, has more than two decades of experience as a faculty member and administrator. He steps in to relieve Louis V. Paradise, who retired in December after 30 years of service to the university. “James Payne has established himself as an outstanding scholar and administrator,” said UNO President Peter J. Fos. “I am looking forward to working with him." The New Orleans Privateers men's tennis team enters the spring semester cheering Rui Silva, the top-ranked singles' player in the Southland Conference and state of Louisiana, according to the Intercollegiate Tennis Association. The Portugal native is the first UNO student-athlete to be ranked nationally in singles' play since 2003. A transfer from Virginia Commonwealth, Silva posted a perfect 7-0 record in singles' play during the fall season highlighted by a tournament championship at the UNO-hosted Big Easy Classic without conceding a set. Silva's run to the tournament championship included a trio of victories over foes from Southland Conference rival Nicholls State. Nicholls finished as the Southland runner-up in the 2012 edition of the league's annual tournament. Cheer on the Privateers as they take on New Jersey Institute of Technology January 21. Keep on shouting for the Star-Steppin’ Cosmonaughties halftime performance. The official dance team of Krewe de Lune will be making their Lakefront Arena debut! Use special code “COSMO” on Ticketmaster for $5 tickets, exclusively for alumni. Come be a part of the show! Join the Krewe of UNO Mardi Gras Parade! With national attention on New Orleans at the exciting juncture of Super Bowl XLVII and Mardi Gras, the university has decided to make the 4th annual Krewe of UNO parade bigger and better than ever. The Krewe is looking to alumni for assistance and participation. They are hoping to borrow flatbeds (think truck floats), trailers that could be converted temporarily into floats, or anyone who might like to participate in some way. If you are interested in participating or know of any resources that may be available, please contact Associate Dean of Student Affairs Amy King (M.Ed 97) at (504) 280-6222 or aaking@uno.edu. The University of New Orleans conferred 858 academic degrees at a commencement ceremony on Saturday, December 15th at the Lakefront Arena. The graduates, wearing traditional black robes, hailed from 43 states and 55 countries. UNO President Peter J. Fos presided over the ceremony and awarded diplomas while Patrick Scheuermann (BS 86), director of NASA's Marshall Space Flight Center, served as keynote speaker. UNO Senate Faculty President Dinah M. Payne, a professor of management, carried the University Mace, a symbol of authority in the procession and recession.